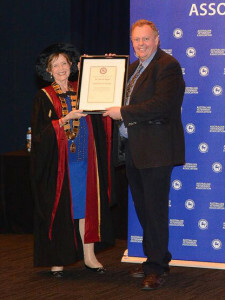 Australian Veterinary Association President’s Award for Dr David Beggs. The AVA President’s Award was established in 2006. This prize is awarded by the President and the AVA Board to a veterinarian who makes an outstanding practical contribution to veterinary science or practice in Australia. Dr David Beggs has more than 20 years experience as a cattle veterinarian, during which time he has been committed to the AVA, the cattle industry and to scientific research. David grew up on a merino stud in western Victoria. After graduating from Veterinary Science in 1990, David took a mixed practice job in Smithton, Tasmania. After a year there he moved closer to home and relocated to Warrnambool. To the surprise of his friends and family he became a cattle veterinarian with a strong interest in computer technology and how this could be integrated into veterinary practice. Building on these interests he completed an MVS degree in dairy medicine and production in 1998, with his major project being, ‘A stochastic model to predict fertility in dairy herds’. David is the author of several computer software programs including the widely used ‘Dairy Data’ and ‘Bull Reporter’. Currently he works part-time in Warrnambool, and is Scientific Officer for Australian Cattle Veterinarians. David is a past convener of the AVA Conference, lectures at the University of Melbourne and is undertaking a PhD on the topic of ensuring dairy cow welfare with increasing scale of production. David has a willingness and capacity to contribute to the AVA in many areas. He played a significant role in the recent and very successful World Buiatrics Conference held in Cairns and he also set up and moderates the ACV ListServ that is widely used and valued by ACV members. More recently, he has been coordinating the AVA response to the Bovine Johnes Disease review. In addition to the many and varies roles he has with Australian Cattle Veterinarians and the AVA, David serves his local community in a variety of roles and he supports organisations that are dedicated to assisting children with autism. Everyone at Warrnambool Veterinary extends their congratulations to David on this prestigious and well-deserved award. Well done Beggsy!